The Pressgang, George Morland, 1790, Wikiart. It has been quite some time since we've featured press gangs on here! The practice continued throughout the eighteenth and well into the nineteenth century, going so far as to spark international incidents and at least one war. 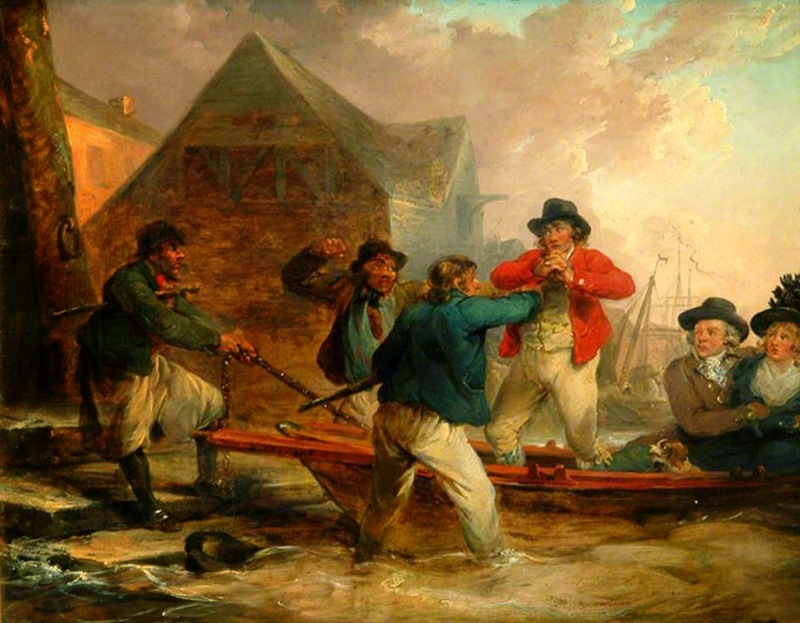 Though this period is beyond the scope of our blog, you'll find plenty of information on the period from 1790-1820 at other websites. Back to the matter at hand. 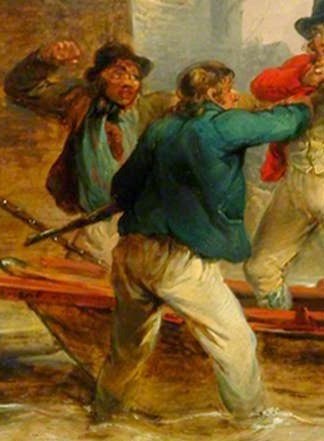 Here we see three tars in a press gang taking hold of a man standing aboard a small boat, while a couple and their dog look on in horror. 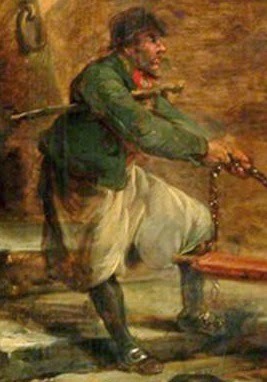 On the far left, holding the boat ashore by its chain, one Jack is clad in a black cap (possibly knit, though impossible to tell), a short blue jacket with short slashed cuffs, a plain white pair of slops, red waistcoat, and unusual black stockings. A gnarled walking stick, cudgel, or rattan is tucked under one arm. In the water beside him floats a round hat that, presumably, belongs to the bare headed tar at the center of the piece. He wears a blue jacket that ends at his waist with waist pockets and (though I'm not positive) a single vent at the back. Though we cannot see his front, we can say he wears a pair of white trousers and also carries a rattan or cudgel. To the starboard of the boat stands another sailor with a raised fist. He too has a round hat, but his jacket is brown. The shirt is a light blue, with a black neckcloth at his collar. This seafarer wears either a pair of slops or trousers, though it is difficult to say exactly.